Jimmy Woods (f, as); Gabor Szabo (g, arr); Albert Stinson (b); Chico Hamilton (d, perc) and unknown electronics. Note: (1) Other titles on CAM (It) AMG-1 without Chico Hamilton and Gabor Szabo. (2) The title "Carol's Walk" appearing on Harkit (E) HRKCD 8246 [CD] is originally from Chico Hamilton's album CHIC CHIC CHICO. All other titles on Harkit (E) HRKCD 8246 [CD] without Gabor Szabo. Issues: a-d on CAM (It) AMG-1 titled A STUDY IN TERROR/REPULSION (?) and Harkit (E) HRKCD 8246 [CD] titled THE FILM MUSIC OF CHICO HAMILTON (issued 2008). The REPULSION "soundtrack" was first issued on CD in 2008 by the British label, Harkit, a company that specializes in British soundtracks, particularly those from the 1960s such as MODESTY BLAISE. 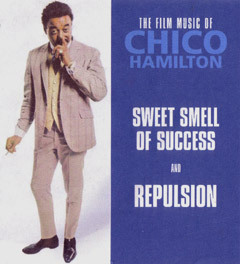 This CD features tracks from Chico Hamilton's earlier soundtrack SWEET SMELL OF SUCCESS (without Gabor Szabo), the 1965 Impulse recording of REPULSION's main theme, "Carol's Walk", from CHIC CHIC CHICO, and four tracks more or less taken from Roman Polanski's 1965 film. The source of the REPULSION music is most likely a vinyl copy of the highly obscure album issued by the well-regarded Italian label CAM many years ago. The cracks and pops may have been digitized out, but the sound is quite muffled, even a little out of key, like the record was playing a bit too slowly and in another room. It's clearly at odds with the much better sounding SWEET SMELL OF SUCCESS music which proceeds it and, sadly, makes the REPULSION material sound little better than a bootleg. Still, one must wonder about this particular presentation of the REPULSION "soundtrack". Two tracks - "Seduction In The Dark" and "Repulsion Nocturne", both simple blues - are not even heard in the film, nor is the first 29 seconds of the oddly-titled "Languid Morbosity" (basically more than half of the film's music here), although it's very possible that some of the music Hamilton laid down was simply not used in the film's final edit. - The first 1:17 of "Sophisticated Thrilling", which is more aptly (and correctly) titled "Carol's Walk", is heard at the 00:04:04-00:05:17 point in the film (Carol walking down the street the first time). At the 1:18 point, the theme merely seems to be repeated. - Approximately 29 seconds into "Languid Morbosity" begins the cue heard at the 00:25:22-00:27:08 point in the film (Carol walking down the street a second time). What was left out? Plenty. But in all fairness, it doesn't amount to much in the way of fully formed "songs" as the above two titles do. End Titles (01:38:25:01:39:59) - bells, ticking clocks and Carol's humming are not noted here as "soundtrack" items. In consideration of full disclosure, I must confess that Harkit consulted this writer in early 2007 during the preparation of this CD to request permission for use of the musician credits I assembled above and the notes I wrote below (although the "electronics" credited in the CD jacket aren't heard on the disc since the shock cues were not included). I obliged without any regret, however, I was not consulted on any aspect of preparation in this CD and did not know how it was going to look or sound until I received my own copy of the final CD. I probably would have written my notes differently for inclusion in a CD too. This isn't what I would have proposed and it can't really be considered the very best way of presenting Chico Hamilton and Gabor Szabo's incisive soundtrack. But this may, indeed, be the best we can expect. There is little doubt that Hamilton and Szabo fans will want to have "Sophisticated Thrilling" and "Languid Morbosity" in their collection - even "Carol's Walk" has not shown up on CD prior to this, so that makes this CD collectable for another reason. It's certainly not the definitive REPULSION soundtrack by any means. But it's the only one likely to be made available - so don't wait around for something better. This is probably it. Film credits indicate Hamilton is the composer and conductor and Szabo "orchestrated." Personnel detailed by British jazz critic Brian Priestly, who indicates this group was accompanying Lena Horne at the Talk of the Town club in London at the time of this recording. While Hamilton insists personnel are British musicians, an interesting article in the September 26, 1964, issue of Melody Maker ("The Group Jazz Fans Can't Hear") bears out Priestly's claims. According to the article, Hamilton was unsuccessfully seeking performance opportunities for his quartet after finishing obligations to Ms. Horne in London. Szabo's participation, however, is not in dispute. The Melody Maker article went on to poll each group member about the current state of jazz and his feelings about the Hamilton experience. Szabo commented that jazz was enjoying a healthy state, spurred by "a revolution" in which brave warriors, such as Ornette Coleman, were bound to make enemies. "When I was studying at Berklee," he added in discussing his own role, "I got the feeling I couldn't play the instrument at all, because I could not use my own things as they didn't fit any set pattern. When I joined Chico, he helped me immensely to develop my own style. He never forced me in any set way. At all times, he encouraged me to be myself on the instrument."